Bookings are now open for the Teachers' Edition of the Lecce Italian Language Experience to be held from 1 January 2018 to 21 January 2018. From $AUD5600 twin share. The price includes airfares, accommodation, tuition fees, excursions and other extra-curricular activities. This escorted tour is designed for Italian language teachers to improve their skills as teachers. 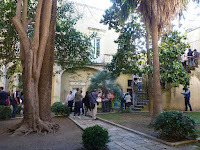 You will attend the School of Italian for Foreigners in Lecce (SIS Lecce). SIS Lecce was the Italian language destination for the Australian Government's Endeavour Scholarship Program* for three years from 2012-14. They have extensive experience in providing programs for teachers. As a professional development program, some or all of the expenses incurred by you may be tax deductible. Non teachers are also very welcome. If you would like to join us but are not from Australia the price will be adjusted according to your local currency and the exchange rate at the time of payment..
Over three weeks, the Teachers' Edition of the Lecce Italian Language Experience will immerse you in the Italian language surrounded by the culture, history and culinary delights of Lecce and the Salento. You will build your Italian language proficiency, observe teachers in Italy, visit schools and collect language resources for use in the classroom. Choose Homestay (+$350 single supplement) for a totally immersive experience. A certificate of attendance and attainment will be issued on completion. Open this link for more information [Jan 2018 - Teachers' Edition]. *The Endeavour Scholarship Program provided overseas scholarships to language teachers for professional development in the country in which the language they taught was the mother tongue.